I recently had the good fortune to attend a screening of Shadows of Liberty at the Peace and Justice Center (PJC) in Burlington, Vermont. This new documentary film, featuring some of the world’s foremost media scholars and indie journalists, takes a hard look at the abysmal state of our mainstream corporate commercial culture of “news” (and I use the term loosely). Here’s a quick summary, and no surprise: In this new digital age, we’ve witnessed a journalistic culture of objectivity giving way to sensationalism, infotainment, advertorials, and crass commercialism of the most sordid kind. While Shadows of Liberty largely ignores the rise of our “Surveillance Economy,” it does a fine job of reminding us what the purpose of real news is—to ask hard questions of those in power, to give voice to the voiceless, and to present multiple perspectives on the important stories of the day. Instead, what we often get, thanks to corporate commercial consolidation and the arrival of the Lords of the Cloud (Facebook, Amazon, Google, and Apple), is a “news” world in which hyper-narcissism meets civic disengagement, a culture in which “selfies” trump community activism and civic responsibility far too often. First, stay informed through alternative-media news sources such as Democracy Now, Truthout, and End the Lie. Second, promote cradle-to-grave media literacy education in every classroom and community: Every thinking citizen must be taught how to “read and write” across multiple media platforms, in keeping with the most enlightened of the Framers’ emphasis on public education and the importance of virtuous citizenship; students should know how to use a video camera as well as a pencil, and a blog platform as easily as a textbook. Third, work for both media justice and media reform: We need to create a world in which a robust media culture driven by democracy, diversity, and decentralism challenges corporate commercial consolidation every step of the way, catalyzed by a growing citizens’ movement in which everyone with an authentic story and Internet access has the capacity to be an indie journalist. Finally, fight for Net Neutrality: An informed society requires a free and unfettered Internet in which everyone, regardless of race, class, gender, sexual orientation, creed, caste, or color, enjoys the same access to our 21st-century world of information. 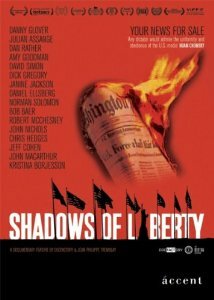 Shadows of Liberty is available for viewing in the PJC Community Library. For more information on the film, go to Shadows of Liberty. And don’t forget to support the work of the PJC!